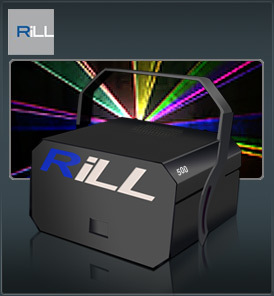 The RiLL Aurora 500 is our entry-level multi-coloured laser system. RiLL Aurora 500 was the 1st laser company in the world to make a full colour laser system over 1000mw at an affordable price. The RiLL Aurora 500 is an awesome and impressive multicoloured laser projector for those that want colour but don’t have a big budget. The RiLL Aurora 500’s colour palate of greens, blues, and reds, is astounding but the colours don’t stop there! Colour mixing through magenta, yellows, oranges and combining to make white is where the Aurora 500 comes into it own. The RiLL Aurora 500 Colour whatever the budget.